Competition for inclusion in the Skeptics Trump deck has been fierce and is hailed as a high accolade that all Skeptic aspire to. 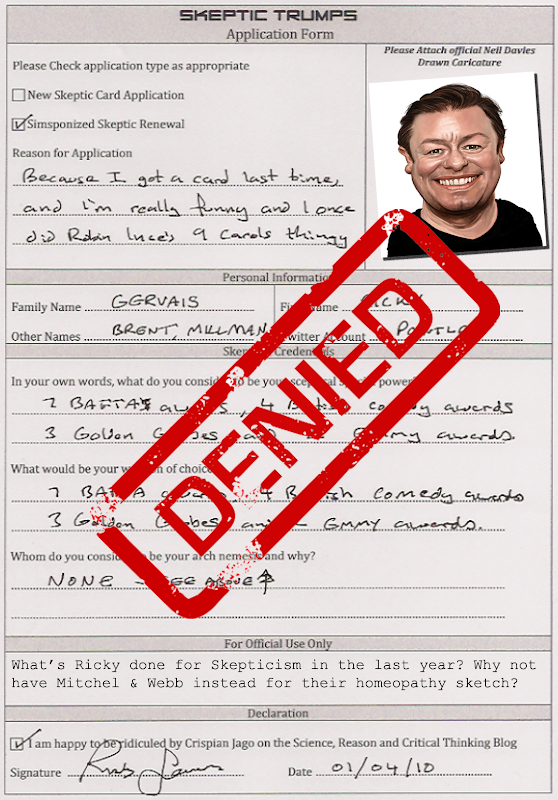 Over 1,000 well known skeptics eagerly submitted their application forms back in March and April with the hope that their contribution to science, reason and critical thinking would afford them a much-coveted Skeptic Trump card. However, with limited cards available, the admissions panel operate a strict inclusion policy. Each application form is subjected to intense scrutiny to assess the sceptical credentials of the candidate and ensure they have achieved excellence in their particular field. With the unprecedented high number of application forms received, it was inevitable that some skeptics would be disappointed. Fame is no guarantee for inclusion and it can now be revealed that one particular candidates application form seemed rather pedestrian, relying on his inclusion in last years Simpsonized Trumps cards and his celebrity status rather than advancing the causes of skepticism. The executive chairman of the Skeptic Trumps admission panel said that with so many well-known comedians and broadcasters getting behind the libel reform campaign and taking active roles in this years 10:23 campaign, there was simply no room for complacency, and consequently Mr Gervais’s application had been denied. A tall lanky goggle eyed spokesman for Mr Gervais commented that Ricky is utterly devastated by this Portillo like ousting and is considering appealing the decision. Awww, have pity on the poor man. He's only got a +7 BAFTA skill. Oh, yes, he used to be quite famous. And funny. I'd have applied too, Greg! A rejection letter only means "honorable mention", right? I don't know, I think that Genesis bit he did warrants permanent membership! Under weaknesses, he's put "asthma". Well he didn't, but he should have. Oh man, the Mitchell & Webb sketch on homoeopathy deserves a special award from the committee. How about it chaps? I used to work for Mr Gervais. Not that he would remember. As a card holder, I can vouch for him if that helps his application. I also contributed a couple of lines to the Office, not that Mr Gervais even knew. So actually I withdraw my support. this guy spews as many false concepts as karl pilkington, if not more. i doubt one can truly manage being a skeptic and a mouthy egotistical buffoon with poor fact retention at the same time.